Get the same survival training that the U.S. military uses for its troops. 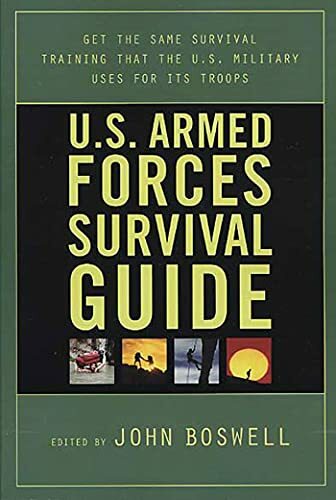 The U.S. Armed Forces Survival Guide is the only source hikers, campers, explorers or families focused on emergency preparedness will ever need. The U.S. Armed Forces Survial Guide covers everything a modern outdoorsperson needs to know to make it in tough terrain and tense situations, from the psychology of survial and overcoming fear to building a shelter and making it through a natural disaster, such as a hurricane or earthquake. Every kind of environment--from tropical to desert, aquatic to arctic--is covered. The U.S. Armed Forces Survival Guide is the most comprehensive and thoroughly tested survival manual ever published. John Boswell is a former Naval officer and graduate of the U.S. Navy's SERE (Survival, Evasion, Resistance, and Escape) School. Boswell is a writer, editor and literary agent who has worked in publishing for nine years.